Stephanie Stunned is a little girl with a huge imagination. The strangest thngs happen to her. Come along into Stephanie‘s world: You‘ll be stunned! 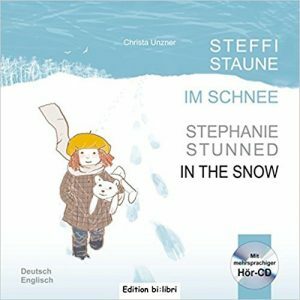 Stephanie stands at the window, watching the snow flakes. Her mother tells her that “tomorrow everything will be white“ and this turns out to be the case. Stephanie and her polar bear Ole walk through the white landscape, meeting neighbours and animals. Polar bear Ole keeps growing as they walk on. Stephanie is afraid when they have to jump across a ravine, because Ole is aiming for the North Pole. But then a white wonderland stretches out beneath them. When Stephanie wakes up in her bed, everything outside her bedroom window is white, too.